Aid Lyranth on her path to vengeance, and liberate some lost souls along the way. 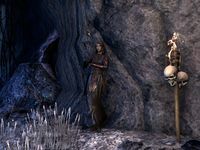 I have agreed to help a Daedra called Lyranth attack the Imperial City Prison, which has been overrun by others of her kind. I can free the mortal prisoners held within, but my goal is to eliminate the Daedric invaders. Defeat the Flesh Sculptor and progress through the prison. Defeat the Gravelight Sentry and his necromancer cabal. When you enter the prison, you'll find that it's taken quite the beating. Lyranth will tell you that she needs your help to kill the Flesh Sculptor and the Lord Warden of the prison. You agree and delve deeper into the complex. Feel free to liberate the prisoners in the cells as you make your way through the Imperial City Prison. There should be a lever by every full cell block that will open every cell on that block. Defeat the Overfiend and the Harvester that is summoned to aid him. Then cut your way through Daedra until you reach Ibomez Flesh Sculptor. After offing Ibomez, Lyranth says that the Gravelight Sentry is the only thing between you and the prison's new Warden. Navigate the tunnels between the prison, defeat the Gravelight Sentry and the Flesh Abomination, then take on the Lord Warden's Council. You learn that Lyranth bears a grudge against the Lord Warden, as he trapped the living essence of her clan members to make a set of armor for himself. Defeat Lord Warden Dusk, free Lyranth's clan members, and watch as Lyranth traps the Lord Warden himself inside of a shield. She thanks you for your service, but tells you that you may want to leave, seeing as how the prison is still owned by Molag Bal, and someone needs to run it for him. Take your talking shield and claim the reward for this quest. The reward for this quest, Grievous Leeching Ward, is a unique armor piece. It is the only shield in the game that can talk to you. Every now and then when you unsheathe the Grievous Leeching Ward, Lord Warden Dusk himself will have something to say to you. According to Lyranth, I'll have to defeat Overfiend in order to reach the inner halls of the Imperial City Prison. The Overfiend is defeated, and Lyranth has directed me to attack a "flesh sculptor." His laboratory is somewhere up ahead. According to Lyranth, an opponent called the Gravelight Sentry is the only thing standing between me and the Daedric Warden running this prison. I should defeat it and move on. Though I defeated the Flesh Sculptor, a few of his constructs remained in the Warden's possession. I should slay the Flesh Abomination the Warden has sent against me. According to Lyranth, the way out lies ahead, past the final cell block. I've gotten past the Warden's traps, and according to Lyranth, the Warden himself should be somewhere up ahead. I should seek him out and slay him. Finishes quest I should speak to Lyranth. This page was last modified on 17 January 2019, at 15:40.